Tick tock. We talked about the slow life not too long ago, and that it isn't necessarily opposite to the busy life. Rather, slow refers to the pace at which one lives. Still, there are some things, even on a slow paced homestead, that create a sense of time pressure. Planting while conditions are right, for example, or harvesting before things get overripe, or getting the hay in before it rains. 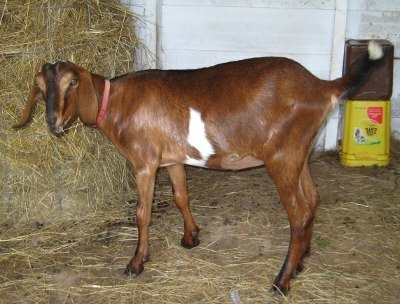 Another is breeding season because some animals, like goats, aren't in season all year long. This is true of Nubians, who are receptive to being bred in the fall. 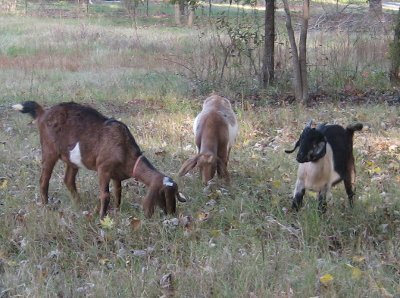 My original goat plan, and the reason I spent the extra pesos to get registered Nubians, was to start my own herd of Kinders. 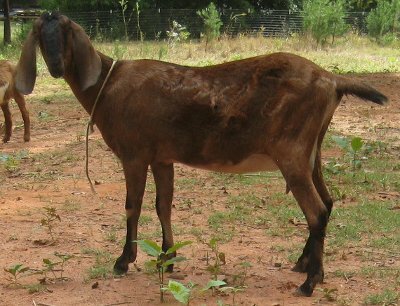 This requires registered Nubian does and a registered Pygmy buck. I've got the first half of the formula, but getting the second half required planning and logistics, i.e. a way to separate the bucks from the does. That was something we didn't have until we finished the new fence. All this was on my mind even before that however. I had been thinking about it all summer, because I knew it wouldn't be long before my girls started coming into heat. I debated a long time about what to do. The last thing I wanted was to wait another year, but the new pasture wasn't fenced yet. After a lot of deliberating, I came up with a plan. Meet Petey. He's 3/4 Nubian, 1/4 Alpine, and about 7 or 8 months old. Being young, he's also small. However, there weren't a lot of choices on craigslist and he seemed the most likely candidate. He fit my requirements for breed and price. He is smaller than the girls, but I figured that if those little Pygmy bucks can manage those big Nubian does, Petey will probably manage too. Introductions went so much smoother than expected. With two fenced areas, I was planning to keep them separate for awhile. But the girls were so interested in him that I let them go ahead and mingle. 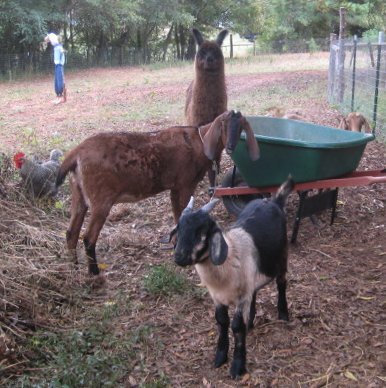 Everybody showed up to check out the new guy: goats, chickens, Charlie Llama, and Riley. They all wanted to sniff, but all Petey wanted to do was explore his new surroundings. Jasmine and Crybaby in particular followed him all over the place, while Surprise just wanted to show him who was boss. 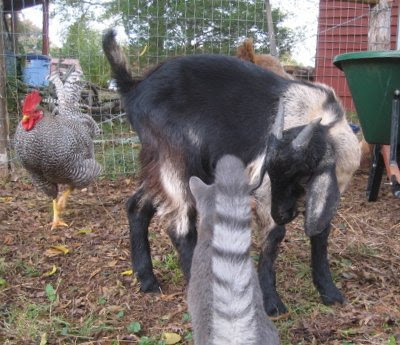 Each goat had a brief go at the head butting ritual to establish herd order, and before I knew it, Little Petey was the one leading out. None of my girls have been receptive to him yet, though he certainly seems willing enough. Does come into heat every 18 to 21 days from about August to December, or maybe January with Nubians. Obviously I'm hoping there's still time for the girls to get pregnant. I am not planning to keep Petey permanently. If all goes according to plan, I will try to sell him for what I paid for him ($50). I will consider his services well worth his keep. Of course, as you read above, my track record on goat plans hasn't been anything to brag about. How it all turns out in the end, remains to be seen. Awesome photos Leigh....he looks perfect to me! Very exciting. I'm looking forward to blogs about kids in the spring...yaae! 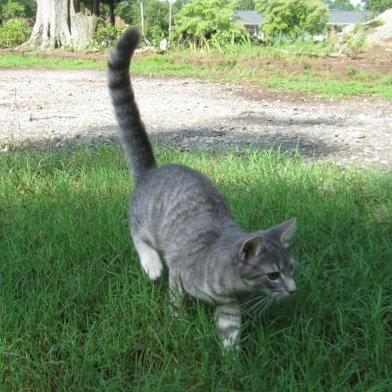 Petey is so adorable....love his coloring! You should get some really nice colors there. Hope it all works out too! Hugs! It's very exciting that you are wanting to raise Kinders! I have been reading/learning about the breed & find there are none here in western NY. If it ever works out for me to have goats I would surely go for Kinders. Now I know who to go to. 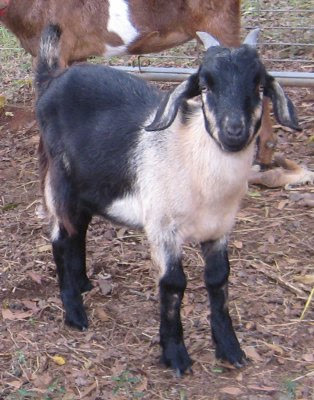 Just learned too that difference between mini Nubians & Kinders when I found someone not too far away that has minis. Seems like a great plan to have Petey for the breeding season. It will be fun to find out how yours & nature's plans together unfold. Bettina, kind of like "robbing the cradle," eh? I did do some research on this before buying him. The gal with the 2 month old Pygmy bucklings said the earliest she would breed a buck was at 5 months old, and then only selectively. At 8 months to 1 year old, a buckling can safely cover 10 does, assuming he can reach them. Since I only have three, I decided not to worry about age, just height. Vicki, what's that line in Fiddler On The Roof, "from your mouth to God's ear." I really hope I'm blogging about kids in the spring! Pam, his coloring was what sold me. Thanks for the good wishes! Alison, in terms of due dates, I figure that since I only have three does, it will be easy to know who's receptive. If I had more, a marking system would be very practical. In fact, Surprise, after all her protests, indeed was receptive to his advances the very next day. Whether or not they managed to consummate, I didn't observe. I've just marked her name on the calendar with a question mark. It will give me a basis for being prepared 5 months from now. Michelle, hurray for Kinders! Like you, no one in my tri-state area has kinders. I wish I could have looked for a registered Pygmy buck sooner, but we just weren't set up for that yet. I'll start looking again in the spring, with the intent of getting one who will be old enough to breed my girls next fall. I think you'll witness the breeding. I put a little buck with my does like you. All the goats and sheep together and all is well. Does are usually vocal and flirty with the buck so I don't think you will miss anything! Over the years when my does were ready to give birth they always told me also. Followed me all over crying "Please stay don't leave"! You'll know. I think that little Petey has a big job ahead of him. It will be really neat to see how all of this works out for you and I think you came up with a really good plan. It sounds like a great plan to me. I would love to do goats but no one in my house likes goat milk. We are currently working towards a family cow ie. fencing and such. I would love to have goats. However, I don't have good fences, and I have too many other things on my plate. 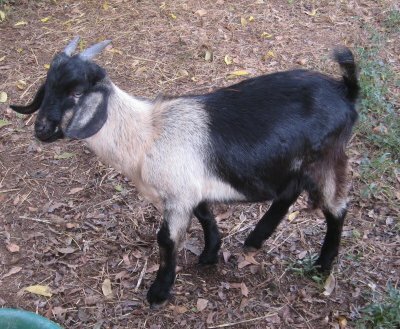 I have a source for goat milk, so if I ever want to make cheese, I can. Good luck on the girls! I hope he works out for you. Really exciting... I am looking forward to reading about how things go. 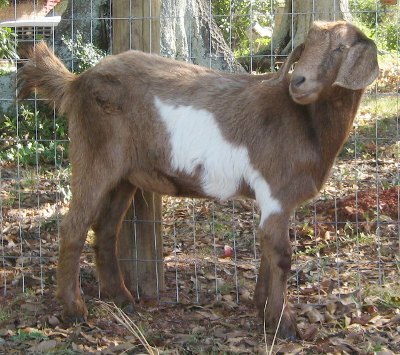 We are thinking about getting a couple of meat goats; I'm not quite ready for milking yet. For future reference, Leigh, synchronizing the does with CIDRs (hormone "tampons") isn't THAT expensive. I did my ewes for the first time this fall because I had a limited-time use of a leased ram. The implants come in a package of 20 (which I split with two other breeders), making the cost $4.00 each (the applicator was $5). Not only that, but they can be sterilized, stored in the freezer, and used a second year with the same effectiveness, according to those who have done it. I'll let you know how it worked for me next March! Mim, that's encouraging information, thank you. The breeding part of having goats is new to me. I feel that there's so much to learn. Mr. H, I appreciate that. Time will tell. Mrs. Trixi, actually, neither Dan nor I drink milk either. Seems funny then that I should want to breed goats for milk, but I do make a lot of yogurt, yogurt cheese, and whey. And Dan loves cheese so I'm looking forward to learning how to make that. Then there's goat milk soap. Or feed extra milk to the chickens and possible future pig! Laura, that's certainly a possibility. 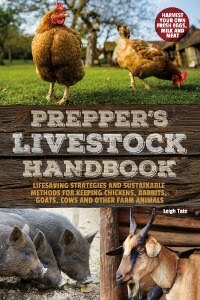 We have always planned to raise goat for meat, just haven't figured out what we'd need for butchering. Obviously a bigger job than a chicken. Thank Renee. Riley was really curious, but is a little cautious of Petey. Of course, Petey had a bunch of critters all tying to check him out at the same time, so he did tend to defend his personal space. Riley does love the barnyard animals though. Heather, I'm ready for the milking, but no the butchering yet. LOL. I certainly like Laura's suggestion of sausage though. Michelle, thank you for that! I didn't have a clue. By that time the whole thing was getting a bit overwhelming so I went on to the next plan. I may need that information in the future however. Ozark, Riley is everybody's friend. He's just a mellow guy who get's along with everyone. He's a little cautious around Petey though. I think it's the horns. 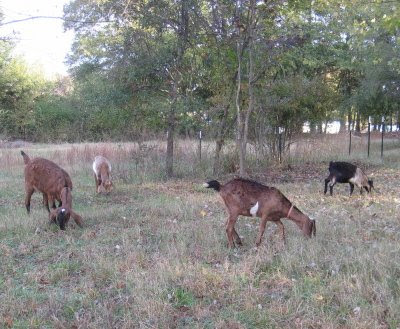 How do you keep them on a 5-acre lot without a fence? We have 5 acres in western WA and desperately want goats but DH is taking forever to clear the lot line to put up a fence. Hello Anonymous. It is fenced, or about 2 acres of it is. We did have to put the fence up ourselves. The honor of clearing the future,but badly overgrown fence line fell to me. 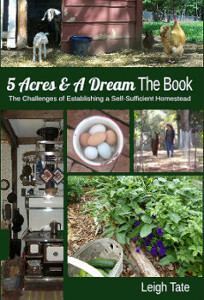 It took me all last summer, and the first acre was fenced last spring. The second pasture was quicker because it the fence line didn't require as much clearing, plus we tied into the first fence. Granted, it is slow work! Elizabeth, you've got me wondering if I should do the same thing, i.e. put a deposit on a buck for next year. I've heard that in hard times goat sales go up. I can understand why. I looked at a few breeders I was interested in possibly getting a buck from and they all had many if not most of their kids already spoken for, for kidding season 2011. It was rather amazing to me. If I had waited till spring to mull it over I wouldn't be getting the buck I wanted from a breeder I wanted to get it from. I appreciate that information Elizabeth. I don't know if it's the same around here, but it would be better to be safe than sorry!